In most of the western world landfill space has become very expensive. 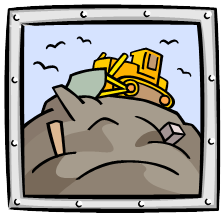 The cost to open a new landfill is high due to the permitting costs and the land cost itself. In places like the eastern seaboard of the USA or Europe where the population density is high, there is an incentive to maximise the input that can go into a landfill. Some of the larger waste management companies are now promoting the use of landfill biodegradable materials to be used in their landfills. They do not want items that will sit there taking up valuable space like non biodegradable materials do. Some modern landfills even go to the next step of recirculating the leachate that collects in the bottom of the landfill. This makes the landfill a proactive bioreactor, allowing the spread of bacteria and the moistening of the landfill material. This accelerates biodegradation by a significant amount. All of this allows the landfill to compact down more and allows the operator to continue to dump more material in it, thus reducing costs. Some critics say biodegradation is not good in a closed landfill as it causes settlement over time as the volume of the fill shrinks as it biodegrades away. This could cause a problem depending on what was built over the closed site. This is true, but this view does not consider modern landfill management techniques. What is being referred to with the bioreactor landfill is achieving settlement of a landfill before it is closed, allowing more material to be emptied into it, then achieving a stable mass after that. Also in some low population density areas where land costs are still low, then adding the cost of the recirculation of the leachate may be too expensive. This would cause the biodegradation to proceed at a slower pace and settling of the landfill over many years could occur. This is true of many current landfills; however, as our population grows and more trash must be disposed of, this situation will become fewer and farther between. Landfill management will need to be brought up to modern methods to reduce demands of finding more and more land. 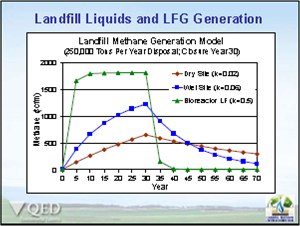 Additionally, operating a landfill as a bioreactor will allow rapid generation of commercial amounts of methane gas. The generation is accelerated due to the spreading of bacteria throughout the landfill and increased moisture levels favouring bacterial growth. Another benefit achieved from pumping of the leachate out of the gas wells and back up into the landfill is that the removal of the liquid from the wells keeps their inlet screens open for maximum landfill gas flow into the wells and up to the surface. This helps maximises gas production from the landfill. The methane gas can be harnessed for energy. Countries need to become less reliant on other countries for their energy supplies as it is an important security issue with huge costs in both financial and human terms. Denmark doesn’t get 20% of its power from windmills because they like windmills. Once capturing of methane gas is started, there are real benefits to greenhouse gas reductions with the methane replacing the use of what would otherwise be other fuels used. The CO2 emissions from combusting natural gas are lower than other fuels like coal or diesel. 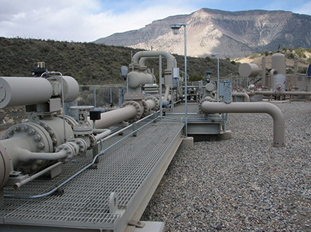 California opened the largest landfill gas to liquefied natural gas facility in the world in Altamont, which is in Northern California. 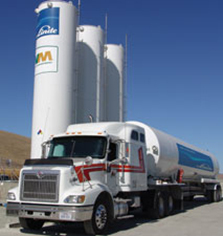 It is jointly owned by Waste Management Inc. (North America’s largest waste management company) and Linde Gases. At the facility, gas is collected from the natural decomposition of organic landfill waste. State officials expect the facility to produce as much as 13,000 gallons of liquefied natural gas (LNG) a day. This allows California to reduce greenhouse gases by an estimated 30,000 tons per year. Almost 500 garbage collection trucks from this facility are fuelled by the LNG produced from the landfill they tip their trash into. Other natural gas facilities are being planned by Waste Management Inc. at some of the 270 active landfills nationwide USA, and the number could grow quickly as communities seek to reduce greenhouse gas pollution. Methane in the Earth’s atmosphere is an important greenhouse gas with a global warming potential (GWP) of 25 compared to CO2 over a 100-year period (although accepted figures probably represent an underestimate). This means that a methane emission will have 25 times the impact on the temperature of a carbon dioxide emission of the same mass over the following hundred years. Methane has a larger effect for a briefer period. It has a short net lifetime of 8.4 years in the atmosphere and is primarily removed by reaction with hydroxyl radicals in the atmosphere, producing carbon dioxide and water. Carbon dioxide has a smaller effect for a longer period (over a hundred years). Because of this difference in effect and time period, the global warming potential of methane over a 20 year time period is 72. The Earth’s atmospheric methane concentration has increased by about 150% since 1750. It accounts for 20% of the total radiative forcing from all of the long-lived and globally mixed greenhouse gases. (These gases don’t include water vapour which is by far the largest component of the greenhouse effect). Usually, excess methane from landfills and other natural producers of methane is burned so CO2 is released into the atmosphere instead of methane, because methane is a more effective greenhouse gas. Global-warming potential (GWP) is a relative measure of how much heat a greenhouse gas traps in the atmosphere. It compares the amount of heat trapped by a certain mass of the gas in question to the amount of heat trapped by a similar mass of carbon dioxide. A GWP is calculated over a specific time interval, commonly 20, 100 or 500 years. GWP is expressed as a factor of carbon dioxide (whose GWP is standardized to one). Thus, a high GWP correlates with a large infrared absorption and a long atmospheric lifetime. The dependence of GWP on the wavelength of absorption is more complicated. Even if a gas absorbs radiation efficiently at a certain wavelength, this may not have much affect its GWP if the atmosphere already absorbs most radiation at that wavelength. A gas has the most effect if it absorbs in a “window” of wavelengths where the atmosphere is fairly transparent. The dependence of GWP as a function of wavelength has been found empirically and published as a graph. What about Incineration or Waste to Energy? In many places and an increasing number of places too, plastic waste (along with other waste) is sent to a Waste to Energy plant where it is combusted to get the energy from it. This is quite efficient energy recapture. The emissions are a big problem, but modern plants have this solved it appears. As for landfill biodegradability vs incineration. There are a couple of factors. In a country like the USA or Australia, land is still plentiful. So for them putting in a landfill is lower cost (upfront that is) than building a waste to energy plant. Hence most waste still goes to landfills in these countries and incineration is not an option. Therefore having anaerobic biodegradation allows methane to be produced and when captured and combusted we get the same energy back again in theory. In actuality landfills are not as efficient as incinerators as preventing loss of methane through the landfill cap is very difficult. Plus is has to be produced in commercial quantities before anyone will go capture the methane. On a side note, bioplastics claim they are compost pile-biodegradable and are therefore green products. However compost piles biodegrade aerobically and do not produce methane but directly produce CO2, therefore any chance of energy capture is lost. So it is not so appealing in actuality. The best option is recycling to make other plastic items, that way the plastic material as a resource, is not lost as it is in incineration or biodegradation. The ultimate backstop philosophy is to make all plastic with a landfill biodegradable additive in it. The plastic can still be recycled, but at the end of its life, when it can no longer be recycled, the plastic can be sent to an incinerator to reclaim its energy, or sent to a landfill to let it biodegrade then reclaim the energy. Under this option we would not have plastic waste accumulating. It would be gone by one of those three methods. This philosophy does not address plastic litter however as landfill biodegradable plastic will not breakdown outside of a landfill.